Much like Robinson Crusoe exploring his island, Daniel Defoe traveled across the island of Britain over several decades and wrote about his adventures. 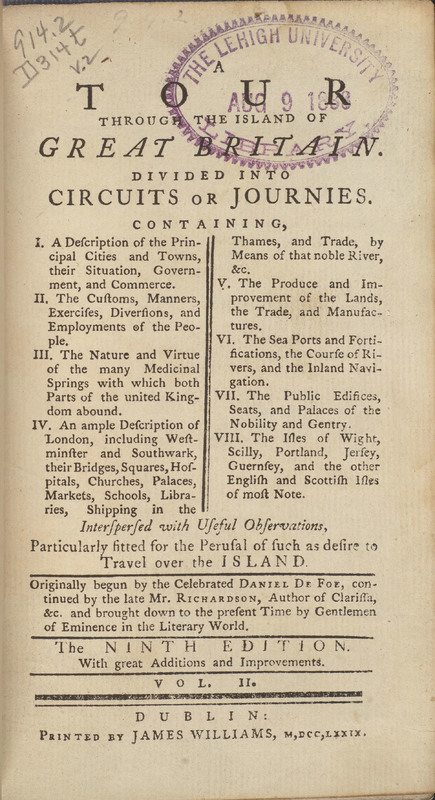 Despite purporting to be based on Defoe’s own travels, it is apparent that he did not visit many of the regions covered, instead relying on other contemporary reports. Defoe gives particular attention to his home of London, including detailed measurements and descriptions of the city’s boundaries. This work focuses on the current economy of Great Britain and its future potential. This is particularly true of Defoe’s analysis of Scotland, whose union with England he had politically advocated for on behalf of the English government. A Tour Through the Island of Great Britain. Dublin: James Williams, 1779.